As informed yesterday, I'm doing Day 31 today, in place of Day 23, because being the new moon, I can't get a photograph of the moon right now. And I don't have one in my old collection either. So I will do Day 23 on 31st of March. I play online/offline games here on my PC. I sleep here when I'm tired. I do Reiki here when I'm not well. And at times, I just simply stand and stare out of the window... watching the sunsets and the pigeons. And that treadmill at the far end of the room... that's just a show piece now. 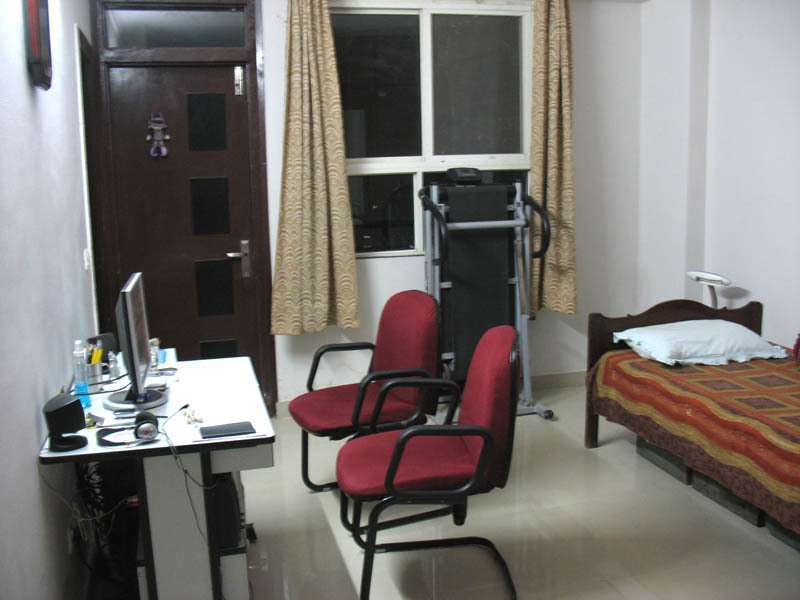 We have a fully equipped gym in our building, which is completely free for the residents here. And it's got some heavy-duty motorized treadmills. So I prefer using one of them instead of my miniscule manual treadmill. This is my 23rd post for NaBloPoMo March 2012. Link to the previous post: "Photo A Day: Kitchen Sink"
that treadmill, is it for sale? that was a hint. you were supposed to offer it to me as a birthday present. I might just, one of these days! Say, what is that figure hanging on the door? What is outside that door? LOL! It's a soft toy. A small one. And my balcony is outside that door. The same one from where I shoot those awesome sunsets. Kaafi upar pahunche huey log hain aap..